This brochure overflows with tempting island getaways for families, holidaymakers and honeymooners alike. Lap up the luxury in Wildlife Safari’s exclusive selection of resorts and hotels. Immerse yourself in a pampering melting pot of peoples and cultures. The exotic influences of Persia, China, Portugal and France are evident in the strikingly fine food, history and people of the islands. Wildlife Safari’s Indian Ocean experts have travelled to every island sourcing the finest beach resorts, hotels, villas and spa retreats for your idyllic island holiday or honeymoon. There’s a long list of island activities to choose from, too – cycling, canoeing, sailing, golf, horse riding, snorkelling, tennis, deep-sea fishing, water skiing, windsurfing and yoga. The hardest part of your Indian Ocean island holiday is choosing where to go, but once you have made your reservation with Wildlife Safari, your arrangements will work seamlessly. Choose from one island getaway or a combination – as the Indian Ocean experts, Wildlife Safari can arrange exclusive holidays in islands not featured in this brochure. 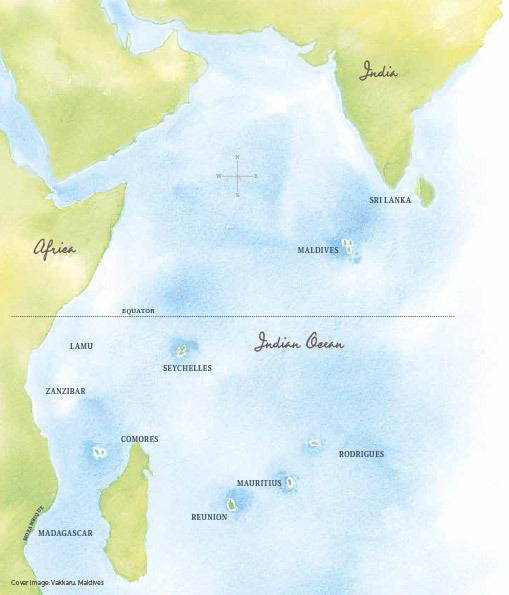 One thing is certain, the Indian Ocean has something for everyone. Combine a holiday in Maldives, Mauritius or the Seychelles with another Indian Ocean island destination for the trip of a lifetime. Experience the colour and vibrant culture of Sri Lanka with a resort island stay at a luxury resort in the Maldives or the Seychelles or combine a Kenya safari with days full of exceptional game viewing with a relaxing stay on a pristine beach in Zanzibar. End an exceptional adventure in Madagascar in search of the lemur and other exotic creatures with a relaxing stay at a resort in Mauritius. The Indian Ocean combinations are endless. Wildlife Safari's team are experts in creating exceptional holidays and our custom-designed Jewels of the Indian Ocean itineraries offer a vast choice of exotic options. Wildlife Safari can also arrange your holiday or private journey to other Indian Ocean islands – Reunion, Rodrigues, Mozambique, Zanzibar and Lamu – as well as holidays at resorts in Maldives, Mauritius and Seychelles that are not featured in this brochure. Wildlife Safari's team of Indian Ocean specialists can also custom design a personal private journey to Sri Lanka or Madagascar. People who ordered Indian Ocean Island Holidays also ordered the free travel brochures below. Click on the images to find out more about these brochures.